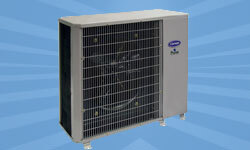 Carrier's full line of air conditioners includes the most energy efficient models available on the market today. The quality of all Carrier air conditioners is backed by a 100% satisfaction guarantee, and has been recognized by Consumers Digest and Builder Magazine. 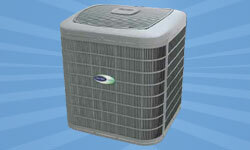 Carrier's durable, energy efficient units come in a range of models to fit most budgets. Whether you're looking for a quality economical option, an efficient compact unit, or one of the quietest, most efficient and well made systems the industry has to offer, Carrier has an air conditioner to meet your needs. Every system uses environmentally sound Puron® refrigerant and is covered by a 10-year warranty. Whatever model you choose, you can rely on Carrier's industry-leading standards for quality materials, superior engineering and green technology. A Comfort/Base Series system will provide you with reliable and efficient cooling for years to come, at a lower initial cost than many other systems. This series can also help you save in the long run; the increased energy efficiency will lower your utility bills, and the quality materials and engineering ensure that your Comfort/Base Series Air Conditioner will run reliably for many years. In addition, the 24ABC6 model qualifies for tax credits. This compact air conditioner allows for convenient installation in spaces too small to for other units. 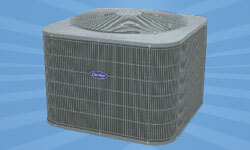 We can even install the Performance Series Compact Air Conditioner on your deck or roof. And like our other air conditioners, the Performance Compact model is quiet, energy efficient, and built to last. Performance™/Comfort Series Central Air Conditioners offer enhanced energy efficiency and quietness, and they are some of the most reliable cooling systems in the industry. Available in two sizes with features including WeatherArmor™ protection and summer dehumidification, you can rely on the Performance™/Comfort Series to keep you cool in the hottest weather and stand the test of time. Infinity® Series Central Air Conditioners are the gold standard in quiet, energy efficient and technologically advanced cooling. The Infinity® Series is engineered with two-stage operation for superior comfort, an Infinity® Control thermostat for maximum performance, Silencer System II™ for the quietest operation, WeatherArmor™ System for extended durability, and enhanced diagnostics with Infinity control. Its exceptional quality makes it an incredible value, and Consumers Digest has awarded the top Infinity® models with their prestigious Best Buy award.